Mushrooms are my all time favorite and i love experiments with mushrooms as it is very flexible for me. 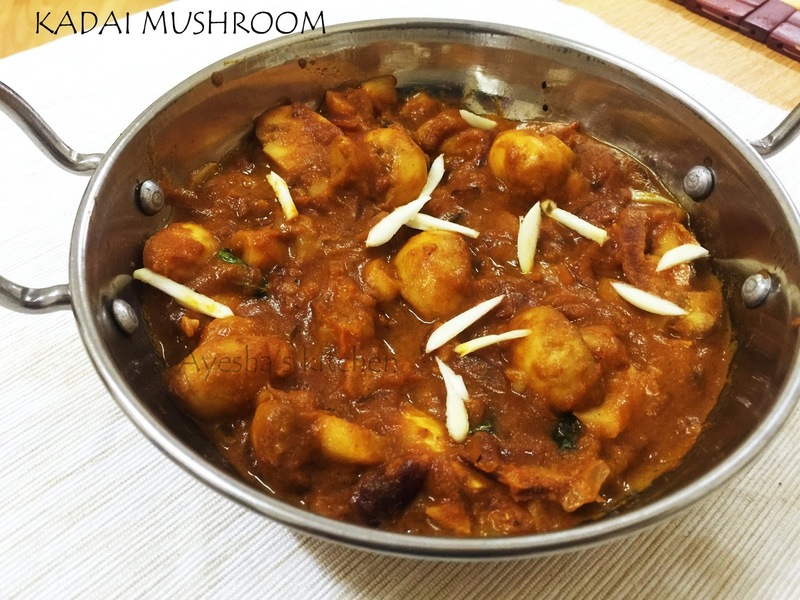 Here am sharing a kadai / karahi mushroom recipe which is very quick and simple to prepare and yet delicious. This is the same recipe which i adapted from my recipe kadai prawns with baby potato. This is a mildly spiced recipe as i used less hot and pungent dried chilies and can be made spicy, hot depending upon the hot dried red chili used. And i here used freshly powdered kadai masala which i shared the recipe below. You can also use store bought kadai masala powder but you never ever get such an aroma, goodness and flavor of homemade spice powder. So let's see how to make kadai mushrooms. Do try and enjoy cooking. Dry roast all these spices in a medium flame until fragrant. Do not burn them. Once it is cooled, grind it to a fine powder. You can make powder in bulk and store it in an airtight container. The above given is the quantity required for this dish only. In the same oil saute the sliced mushrooms for 5 minutes or until it gets browned from the edges. When done transfer it to a plate. Now add few tsp of oil (if needed) in the kadai and saute onion until translucent. Then add crushed ginger, garlic and tomato puree. Saute for a while or until the raw smell disappears. When done, add the sauteed mushrooms and mix well with the onion mixture. Add salt if required. After two minutes add the sauteed tomato along with coriander powder, turmeric powder( optional only), kadai masala powder and salt if required. Stir well and cook until the mushrooms are done or until the oil separates.